There are many ways to show you Love Israel and one of the most direct ways is to buy products from Israel. 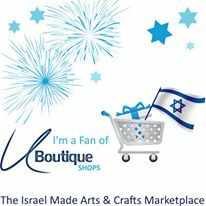 Israeli artisans and designers are known for their quality products and the speed of the Internet can help you choose Israeli made goods from the comfort of your home. Here are some gift selections that ‘say love‘ and are meant to please as well as to show your support by ‘buying Israeli goods’. Love Israel Jewelry– Who doesn’t love Jewelry? What better way to express your love for jewelry and Israel than by wearing it. Necklaces, pendants, earrings and bracelets handmade with pride and ready for shipment directly to your home. Love Israel Judaica- Beautiful and meaningful Judaica products designed to adorn your doorpost, decorate your Shabbat or Holiday table, or to be worn during religious services or as head coverings. For the home you can choose from handmade Mezzuzah cases, decorative cups for Kiddush, candle holders, or colorful Challah bread covers and serving dishes. For him: A Tallit prayer shawl or yamaka. For her: Special designs of tichel-head coverings and wraps. There is a wide variety of meaningful gifts for the young Bar or Bat Mitzva. Love Israel Art – Israeli artists are inspired by the beautiful surroundings of their country and the ever present historical sites that are spreat over the length and breadth of Israel. Landscapes representing Israels, hills, seas, deserts and forests are painted in the amazing colors that make Israel so special a country. If you are looking for inspiring religious scenes than you can choose from a number of interpretations of the magnificent city of Jerusalem . Love Israeli Fashion – Israeli fashion designers have made a name for themselves in fashion markets around the world. Innovative designs backed by rich colors are the signatures of these talented designers many of whom have graduated from the top design schools in Israel. Love Israel Wedding Gifts – Who doesn’t love a beautiful wedding. The same can be said of the special wedding gift offerings that Israeli artisans have produced. Engagement and wedding rings, candle holders, handmade serving pieces, and one of a kind wall hangings for the home are just a few suggestions from the wide range of wedding gifts available. It is easy to love Israel and it is even easier to express that love by buying gifts and goods that are quality made in Israel, the Holy Land.